Dozens of people braved the cold in Nashua, New Hampshire, on Wednesday night to honor a teenager who died after being sucked into a storm drain during last week's heavy rain. 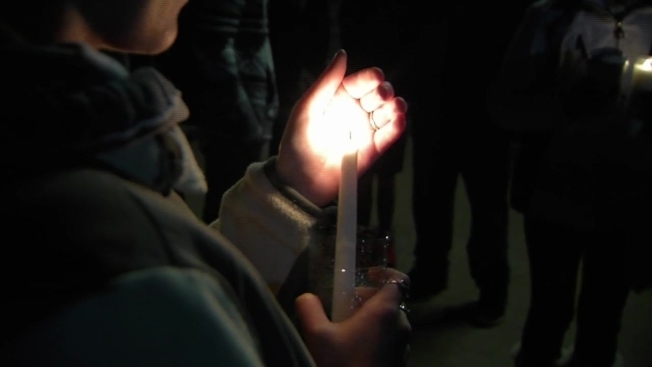 The candlelight vigil was held at the spot where the tragedy happened alongside the Merrimack River. Sixteen-year-old Jacob Goulet died after falling into the drain and ended up in the river. His body was found downriver on Sunday. The people who gathered at the scene for the vigil were family, friends and people who didn't know him at all. They all attended to look for solace and for answers. "He was a really nice kid. He was always uplifted and always trying to make everybody happy," said friend Kayla Jean. "If he saw somebody upset, he had to go to them and make sure they were OK."
City officials say they believe a 4 x 4 foot cover over a pipe somehow came off during the rain storm. Authorities are looking into how it happened and making sure similar covers around town are secure.